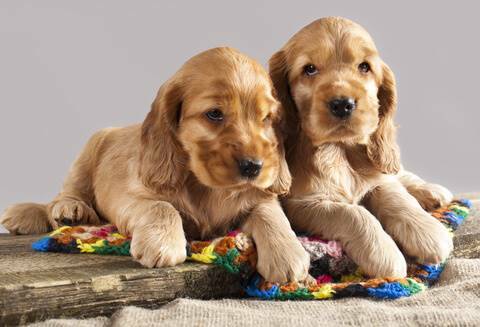 Golden Cocker Spaniels: Our Favourite! Don't you love golden Cocker Spaniels? They're the 'blondes' of the doggie world! Hey, I may be biased, but I adore other Cocker colours too. Read on and discover lots of lovely pictures of cute cockers. I hope you enjoy! Golden Cockers Are My Favorite, What's Yours? There's something so very special about Golden Cocker Spaniels! I'm bound to say that as I own one myself, so I guess I'm a little biased. 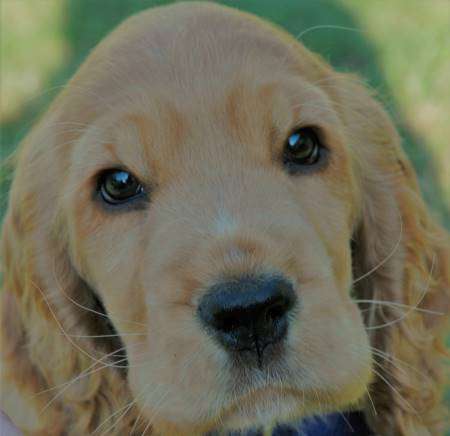 But I also love other Cocker Spaniel colors too, which is why I have photos of all colors on my website, not just the goldens! This beautiful watercolour of Max was commissioned for my birthday by my husband, Don (very sweet!). Max was about 12 months old at the time and I think it's an absolutely gorgeous likeness. My Golden Cocker Spaniel Loves His Walks! Max is three and a half years old in this photo, and looking rather in need of a hair cut! He loved going for walks on this old railway line, which was just behind our house when we lived in North Yorkshire. We walked every day for about an hour and a half. The lane meandered for miles through the Yorkshire countryside so it was safe to let him off his lead. He'd run on ahead, but every now and then he'd stop and look back, just to make sure I was still around. He'd run and run, but never seemed to tire. He's such a little sweetie! He Also Likes To Play Football! 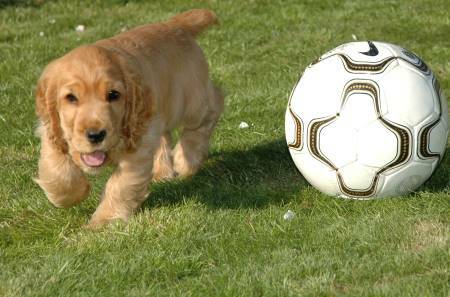 This is him again, much younger, (about three or four months old) playing football. He would try and pick up the ball in his mouth but it was too big for him. Instead, he'd end up rolling over it, but he'd keep trying anyway. It wasn't too long before Einstein realised that he could actually move the football with his nose! Max, my golden cocker spaniel, is still a puppy in this picture, although a few months older. Just look at that appealing little face! I think he's about 7 or 8 months old. We'd been playing ball in the garden (as usual!) and he was exhausted. He'd gone looking for some shade as it was a very hot day, which is extremely unusual for our neck of the woods, however, I wasn't complaining! Max decided he'd had enough and went and sat in the shade under the apple tree until he cooled off and was ready for another game of football. Puppies Grow Up So Quickly! 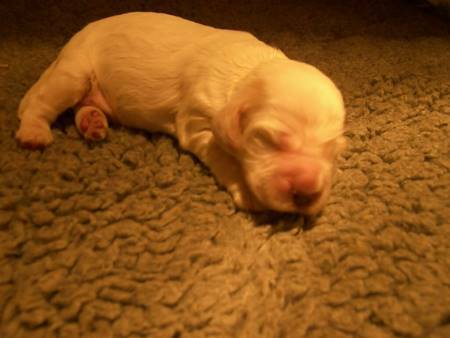 This photo was taken at the breeders house when he was less than one week old. This is Max, 6 days old! Isn't he so cute? Wasn't he just so cute? I remember being so scared of picking him up in case I dropped him! He's almost 11 years old now - where did the time go? Puppy days are very special. Like our youth, they'll never come around again so make sure you and your puppy enjoy those special times while you still can. Appreciate every single day you have together. I'm sure you're aware that Cocker's coats come in many different colours with lots of different markings. I thought it a good place to give them a quick mention here. Cocker Spaniel's come in a variety of colors, some solid, like chocolate, (in fact, chocolate cocker spaniels are our second favorite!) black and, did I mention golden? You can also find a combination of mixed colours and markings, for example, black and white, parti-colours and roans. 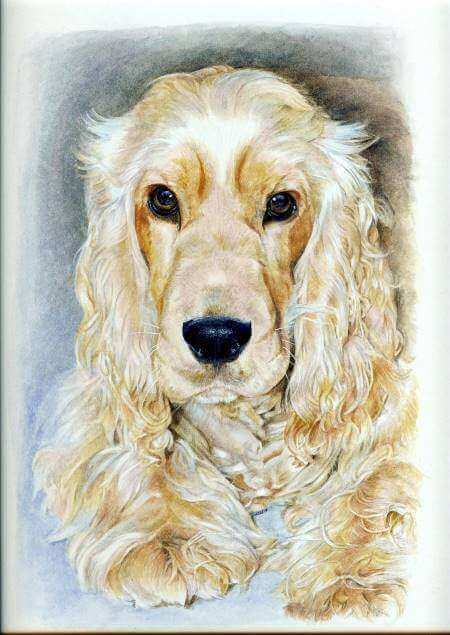 What follows is a brief explanation of Cocker Spaniel coat colors and of some of the terms used to describe them. I'm certainly not an expert on coat colors, but generally speaking, the solid colors (also known as 'self') are chocolate, black, golden, and very rarely seen, sable. Although I've never owned a black Cocker, it's said that the black, glossy coats are much heavier and because of this they may need more grooming than any of the other colors. Golden Cocker Spaniels can range from a light golden color to a very dark rusty shade. 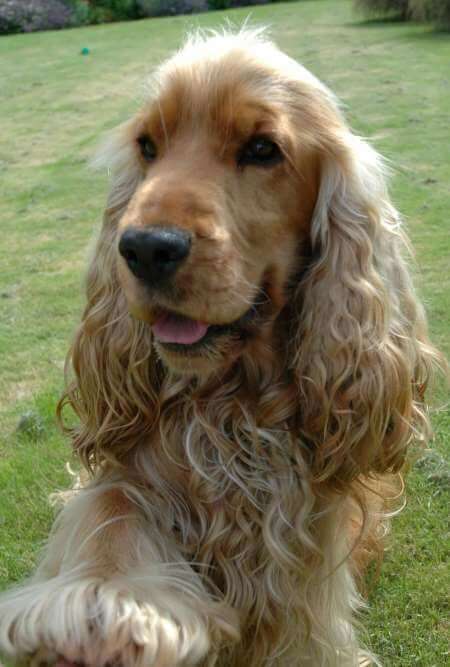 Where the golden coats are darker, they're sometimes referred to as red Cocker Spaniels. Chocolate Cocker Spaniels are a beautiful reddish-chocolate brown and they're often referred to as 'liver' coloured. 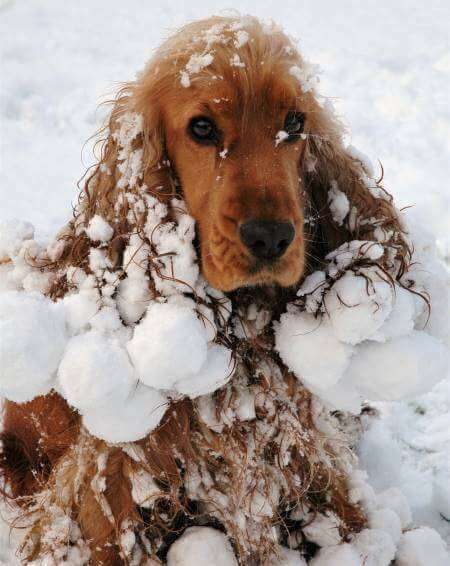 If you're planning to show your pet, breed standards recommend that the coat shouldn't contain any white, however a little patch of white on the chest is allowed. Roan is mixture of white and colored hairs. The colored hairs are usually found in solid patches or clumps, whereas the white areas are usually flecked or 'ticked' with the solid color. The parti-colors usually consist of two colors. chocolate (or liver) and white. Or, in the case of the tricolour, black, white and tan. Ticking is a term used when there are small flecks of color showing in the white of the dog's coat. The term "open marked" is used where there is no ticking or roan markings in the dog's coat, instead the coat will have clear white between the colored patches. You'll also find dogs with tan markings on their face, (above the eyebrows and on the muzzle) under their tails, on their feet, and on their chest. Where the dog's coat is predominantly black, his colouring would be termed black and tan. 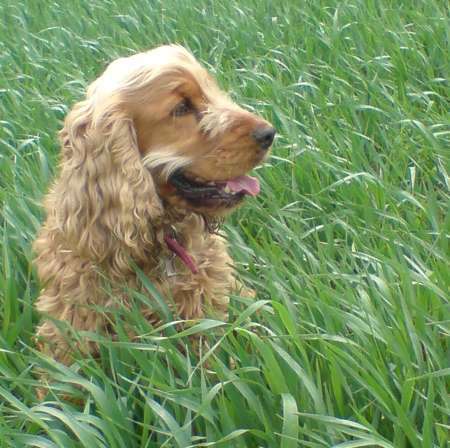 Some breeders say that the golden Cocker Spaniel (and some say all solid colours) is prone to 'Rage Syndrome' but today breeders are very careful and check the history of the sire and dam for any sign of the condition prior to breeding. Thankfully, rage syndrome in Cocker Spaniels is very rare and instances of aggression often tend to be behavioural problems rather than rage. Where a (responsible) breeder has evidence to suggest that any of the dogs has shown signs of rage syndrome, they're unlikely to be used for breeding purposes. Why Not Submit Your Spaniel's Photo Here? Thank you for letting me indulge my love for Max on this page! 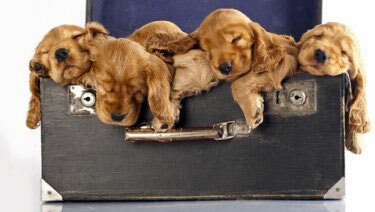 If you'd like to share a photo of your golden Cocker Spaniel (or any colour, for that matter, we love them all!) simply click on this link and follow the instructions!